Programmes raise questions over timer fragment that was part of prosecution case in Lockerbie trial. 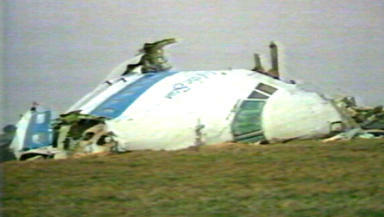 Two documentaries have cast doubts over the reliability of evidence that secured the conviction of the Lockerbie bomber. The programmes screened on Monday raised questions over the origins of a timer fragment which formed an important part of the prosecution case against Abdelbaset al Megrahi. The television documentaries on BBC Scotland and Al Jazeera English also suggested the evidence of key prosecution witness, Maltese shopkeeper Tony Gauci, could have been unreliable. They include inconsistencies about the date Megrahi was said to have visited Mr Gauci's shop and bought clothes, and his description of the man he later identified as Megrahi. Two hundred and seventy people were killed when Pan Am Flight 103 exploded over the town of Lockerbie on December 21 1988. Megrahi was convicted of carrying out the bombing at a Scottish court sitting at Camp Zeist in the Netherlands in 2001 and sentenced to life imprisonment. He was released on compassionate grounds in 2009 after he was diagnosed with terminal cancer. The programmes claimed new evidence about the fragment of timer found in the aftermath of the bombing cast doubt on the case against Megrahi. Scientific analysis suggested there were differences in the metal coatings used in a fragment of a timer allegedly used in the bombing and a control sample from the type supplied to the Libyans by the Swiss manufacturer. One used a coating made wholly of tin; the control sample used an alloy of lead and tin. The programmes claimed the evidence was never revealed to his lawyers and campaigners claimed it could have affected the verdict of the trial judges. In what Megrahi said was his final interview, he reiterated his claim that he was not involved in the bombings - saying he had been treated "very wrongly" by Mr Gauci. BBC and Al Jazeera screened similar footage from the interview, carried out by former policeman George Thomson. Megrahi said he had "never seen" Mr Gauci, whose identification was central to the conviction. The shopkeeper had identified Megrahi as buying clothes, the fragments of which were found among the wreckage of the flight. He said: "I never bought clothes from him. He dealt with me very wrongly. I have never seen him in my life before he came to court. The two shows, BBC Scotland Investigates and Lockerbie: Case Closed, also looked at a report by the Scottish Criminal Cases Review Commission into Megrahi's conviction. The report has never been made public, but the Scottish Government is considering legislation to allow it to be seen. Al Jazeera's programme said it had gained access to the commission's investigations and uncovered "fresh scientific evidence" which is unknown to the commission and, it was claimed, "comprehensively undermines" part of the prosecution case. It re-examined the evidence of Mr Gauci - casting doubt on the date that he said Megrahi had visited his shop, as well as his description of the man who he said had bought the clothes. In his testimony, the shopkeeper said the man he later identified as Megrahi had bought an umbrella because it was raining. The prosecution said Megrahi had been in Malta on December 7. But Maltese meteorologist Major Joseph Mifsud said he had checked his records, and was certain that it had not rained that day. Mr Gauci gave evidence that Christmas lights had not been put up when Megrahi visited on December 7, but former tourism minister Michael Refalo said he had switched on the lights on December 6. Al Jazeera also claimed Mr Gauci had described the man said to be Megrahi as a broad-necked, tall, dark-skinned man, who was 6ft or more, and in his 50s - a description that could not have applied to Megrahi. Both documentaries raised concerns that Mr Gauci had seen a magazine with a photograph of Megrahi published in connection with a piece on the Lockerbie bombing before he identified him in a line-up at Camp Zeist in the Netherlands.